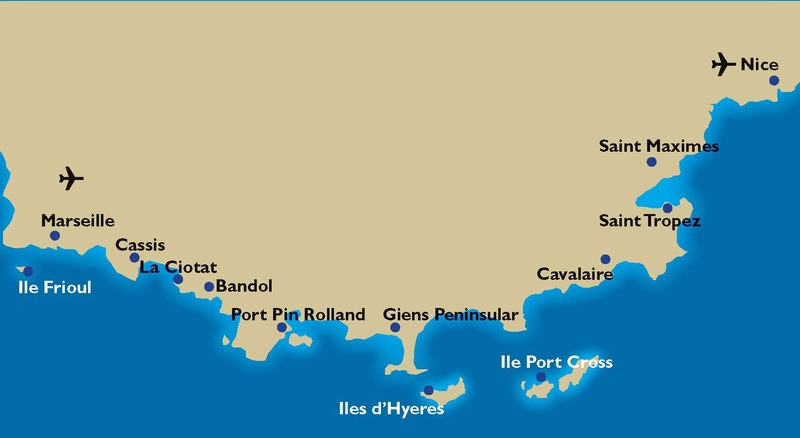 You have a choice of two superb one week itineraries which can be combined for a wonderful two week holiday.The first week sails westwards including Bandol, Cassis, The Isle Frioul and the spectacular Calanques coastal national park. For the second week the flotilla heads east towards St. Topez with Bormes Les Mimosas, Cavalaire and the offshore islands of Port Cros and Porquerolles to tempt you. Sunday: Hyers (16NM) – Depending on weather, we either moor in the marina, or as we prefer, anchor off the beach. Punch party ashore, and a good choice of local restaurants for an evening meal together. Monday: Le Lavandou (13NM) – Le Lavandou is a lovely town, with some great restaurants along the front, or in the road in the hills behind. Enjoy a sundowner on the front whilst taking in a game of petanque. Tuesday: Free sailing - you are spoilt for choice between the mainland coast with Le Lavandou and Rade D’Hyers or the stunning island of Porquerolles, all within easy reach. Wednesday: Ile Port Cros (25nm)– This delightful island and national park has a charming village with a small marina and mooring buoys. Go swimming and snorkeling or enjoy great walks ashore. Sunday: Ile des Embiez (15 NM) – Head west around the headland to the Ile des Embiez, take a walk around the nature reserve and enjoy dinner in a local restaurant. Monday: Cassis (17 NM) – Cassis is a beautiful town, and the brightly coloured buildings on the seafront are picture postcard perfect stops. The island destination is just off the fascinating old town centre of Marseille which is well worth visiting on the regular ‘ navette’ ferry service that takes about 15 minutes. Tuesday: Marseille (14 Nm) - The old port in Marseille is our destination – perfect for exploring the old city, just a few minutes’ walk away. Wednesday: Port Miou (15NM) - We moor on buoys in Port Miou in a pleasant green setting. The historic town of Cassis is a 20-minute scenic walk away. Thursday: Free Sail- For your day of free sailing we recommend the unique Ile de Porquerolles, a delightful offshore island with a pleasant village and marina as well as numerous anchoring opportunities. Saturday: Disembark your yacht at Port Pin Rolland.